Pedestrians walk past an electronic board showing the closing trade numbers of the Hang Seng Index in the Central district of Hong Kong on July 6, 2015. Hong Kong's Hang Seng Index has broken two significant support features, suggesting a continuation of its downtrend —with a downside target near 25,200. 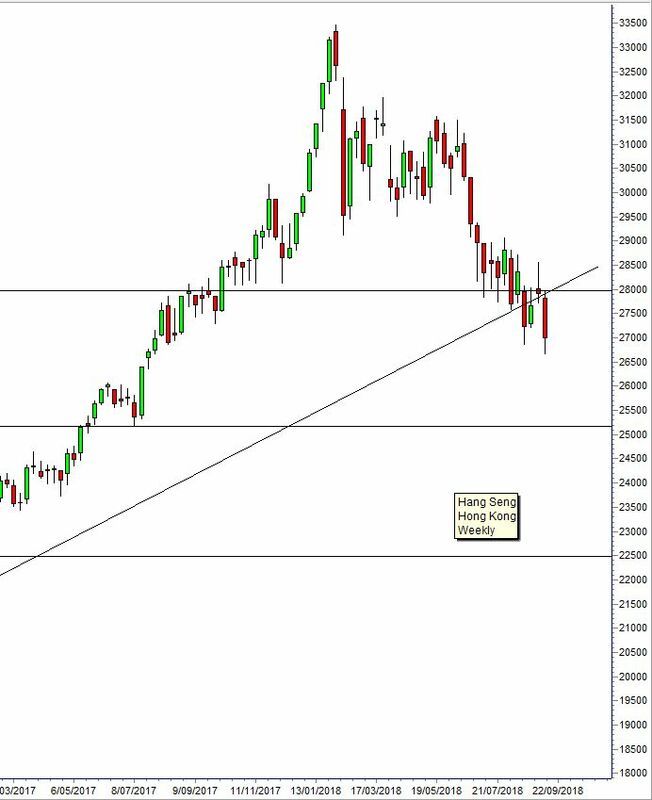 The Hang Seng has the appearance of a "head and shoulders" pattern, but that isn't valid. The right shoulder of the pattern is created by just two days of activity. The reversal is too small and too brief to be considered as a left shoulder development. The first significant support feature to be broken is the historical support resistance level near 28,000. That is the upper edge of a trading band projection. The lower edge of the trading is the current downside target level. The price fall below 28,000 was not a clear fall. There was consolidation around this level, and the potential for a rally rebound to develop. However, the fall below the second support feature has confirmed the downtrend. The second support feature is the uptrend line that is projected from the anchor points in February, July and December of 2016. This is a long projection of the trend line, but it can at times provide a future support level. The current move is a fall below the line, followed by a small rebound and retest of the line as a resistance level. The second retreat from the line confirms the continuation of the downtrend. It is significant that the value of the trend line matches the value of the support level and that increases the significance of the fall below the two features. The downside target is set using the width of the trading bands. The 25,200 level has acted as a strong resistance level in 2014, 2015 and in 2017. Traders will watch for consolidation to develop near the 25,200 level. We use the ANTSSYS trading method to extract good returns from the potentially fast fall as the retreat develops. Traders will cover shorts near 25,200. A move above resistance near 28,000 shows consolidation near that level, but it is not a signal for a new rally uptrend. Daryl Guppy is a trader and author of Trend Trading, The 36 Strategies of the Chinese for Financial Traders, which can be found at www.guppytraders.com. He is a regular guest on CNBC Asia Squawk Box. He is a speaker at trading conferences in China, Asia, Australia and Europe. He is a special consultant to AxiCorp. The breakout in the U.S. dollar appears to have slowed, so investors across the board are eager to determine if that is the end of dollar strength, or just a pause. Before we get too carried away with the idea of a strong dollar it's useful to look at the chart. The dollar index at 95 is not a strong dollar when compared to the December 2016 peaks around 103. It is, however, stronger than it was in March when it hammered out at a low near 88. Currently, the dollar has reacted away from the relatively weak resistance level near 97. That is a technical resistance level calculated by projecting the trading band behavior. Using the same trade band projection methods, a breakout above 97 has a target near 99. That's a stronger resistance target that is confirmed by previous price activity near the level. The 97 level is a weak resistance level, so the pullback is not a reaction away from strong resistance. That suggests the pullback is more consistent with the normal rally-and-retreat behavior seen in any trend. The key evidence that answers the question is found in the relationships within the elements of the Guppy Multiple Moving Average indicator. Trend analysis is applied using the GMMA, which shows the uptrend is gathering strength. There are three GMMA trend analysis features. The first feature is that the long-term GMMA has compressed and turned upwards. That is bullish. The second feature is the way the price has clustered along the upper edge of the short-term GMMA as the rally developed. That further confirms uptrend strength. The third feature is the way the short-term GMMA has moved above the long-term GMMA and also expanded. That shows traders are confident in the trend change. They enter the market as long-side buyers when weakness develops. That buying uses the lower edge of the short-term GMMA as a support rebound feature. Those features — strong GMMA trend behavior and weak resistance — suggest it is easy for the dollar to develop more upside. The upside targets are well defined using trading band analysis. 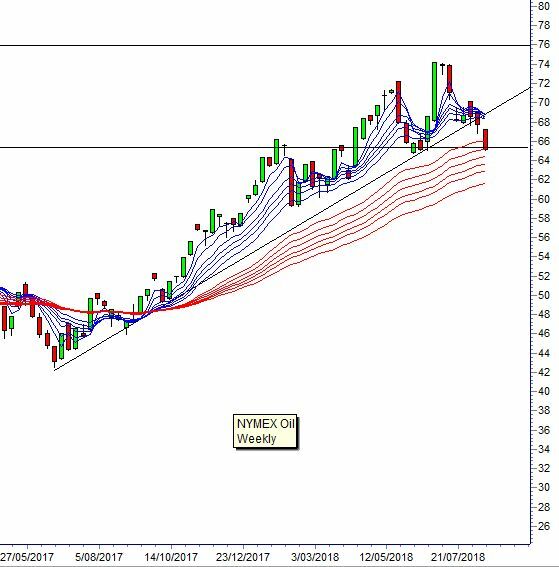 Traders watch for consolidation and a rebound from 95 followed by a test of the upper edge of the trading band near 97. A breakout above that level has a trade band target near 99. We use the ANTSSYS trading method to extract good returns from the potentially fast rally as the rebound develops. A heavy crude oil pump. A little over a month ago I wrote about NYMEX oil and suggested that the pullback was a buying opportunity. 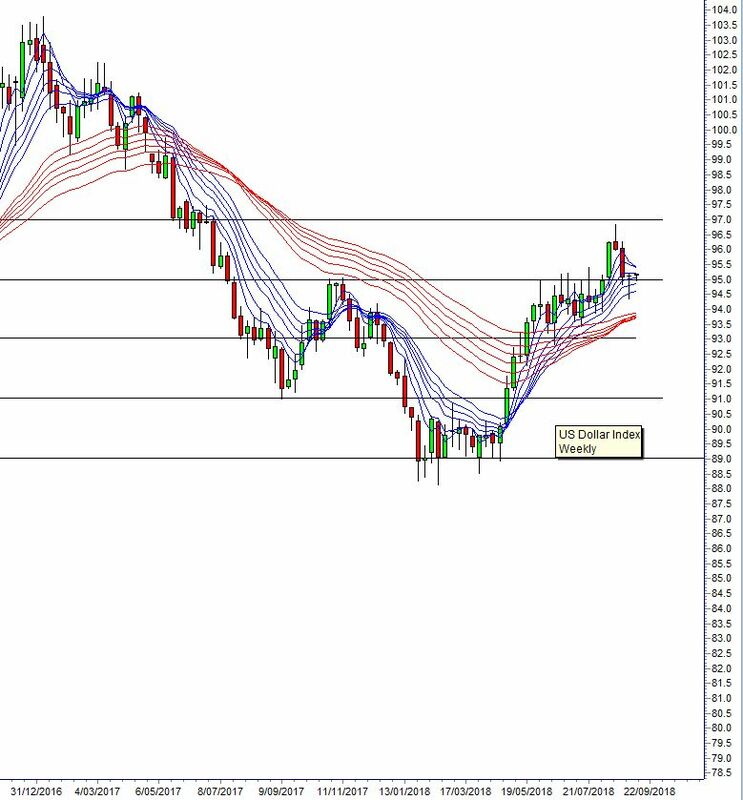 Investors watch for the opportunity to add to long positions as the price rebounds from any of the three support features on the oil price chart. To date, the price has not rebounded. Does that analysis still hold as oil falls towards $65? The short answer is "yes," but with the repeated caveat that traders need to wait for evidence of a rebound before taking a long position. The analysis holds because the technical structure of the NYMEX oil market remains the same. The fall below the long-term uptrend line is potentially bearish, but other features suggest the bear is not in command of the market. The future importance of the uptrend line is the way this will now act as a resistance level for future rallies. Extending the line into the future suggests that it may be early 2019 before there is a serious challenge to the $76 price level. The extended line acts as a resistance level. That time frame changes if oil is able to move above the trend line and again use it as a support level. The first support feature of the chart is the long-term support level near $65. That was the support base for the most recent strong rebound rally. That level is currently under test. Oil has a well-established pattern of moving in trading bands around $11 wide. The current price activity is testing the lower edge of the trading band. Applying trade band projection methods gives a long-term target near $76. Achieving that target is hampered by the way the projected uptrend line now acts as a resistance level. The second trend feature is shown with the Guppy Multiple Moving Average indicator. Despite the price retreat, the long-term group of averages is well separated, which shows strong and consistent investor support for a rising trend. When price retreats, then investors come into the market as buyers. This is the most consistent trend support behavior shown in the GMMA indicator on the oil chart in nearly a decade. Compression in the group shows the development of a trend change and compression is currently not developing. The degree of separation between the long-term and short-term GMMA is largely steady. The consistent degree of separation is a characteristic seen with stable trends, which again suggests that the current extended retreat is temporary rather than the beginning of a trend change. The short-term group of averages reflects the way traders are thinking and its shows an appetite for short-term trade opportunities. Those support features and the trend strength features all continue to suggest that the oil price is experiencing a temporary retreat. The longer-term trading band target is near $76, but it may take four or five months to achieve. We use the ANTSYSS trade method to extract good returns from this trend behavior. The market contradiction with the Australian dollar persists. The Australian market is making new 10-year highs, although the ASX 200 index has stalled near resistance at 6,300. New and persistent market highs are a sign of economic strength, although the Reserve Bank of Australia continues with low interest rates while it waits for growth to pick up. When the Australian dollar last fell dramatically from $0.94 to $0.69 in 2014 to 2016, it matched a fall in the Australian Index from 5,976 to 4,746. We are not currently seeing the same dramatic fall in the Australian dollar, but we are seeing a contradiction in market behavior. Here's the contradiction: The Australian dollar is falling and the Australian market is making new 10-year highs. The Australian dollar broke the long-term uptrend in April and quickly developed a substantial downtrend. It reached 12-month lows at $0.74 and now looks to be heading toward two-year lows near $0.715. Australia's central bank is celebrating because it has been aiming for a lower dollar as a matter of principle. The last time the Australian market was trading near the current highs, the Aussie was trading at $0.81 rather than heading for a low of $0.715. The last time the AUD traded around $0.715 the Australian index was at a low near 4,750 rather than a 10-year high near 6,300. When the AUD uptrend line was broken near $0.765 it took less than three weeks to touch $0.74. This support level has been tough and the AUD hovered around it for the past eight weeks. A fall below $0.74 has a downside target near $0.715. That target is established using the support area tested in 2016 and 2017. The trajectory of the Aussie dollar suggests the contradiction may be resolved with the Aussie market moving back into trend sync with the Aussie dollar. The prolonged, and to date, unsuccessful, testing of resistance near 6,300 suggests some trend weakness. However, this is not supported by other trend indicators, which show a sustainable uptrend. The weakness in the Australian dollar started in January this year. The rebound strength in the U.S. dollar didn't start until April following a consolidation near $0.89. That four month period suggests there is a weak relationship between Australian dollar weakness and U.S. dollar strength. The contradiction between Australian dollar weakness and Australian market strength is not easily resolved. 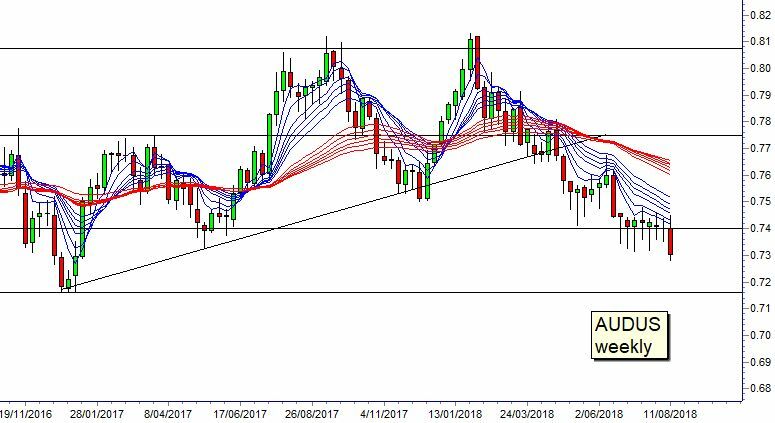 Traders are alert for evidence of a pullback in the Australian market if the Aussie dollar fails to hold support near $0.74. Traders who went short gold in May are beginning to consider covering their short positions. The collapse of the gold price was a classic trend change. It started with a retreat from a strongly defined resistance level near $1,365. It continued with a move below the long-term uptrend line that had been in place since December, 2016. It was confirmed with compression and crossover in the Guppy Multiple Moving Average indicator. Both traders and investors agreed it was time to sell, and the downtrend accelerated. The strongest historical support level is near $1,210 and traders will prepare for a potential rebound from that level. A support level is when price has fallen to that level and then rebounded and developed a new uptrend. Traders looking for similar multiple confirmation signals of a classic up trend change will be disappointed. When the gold price rebounds, it tends to do so rapidly without any consolidation activity. 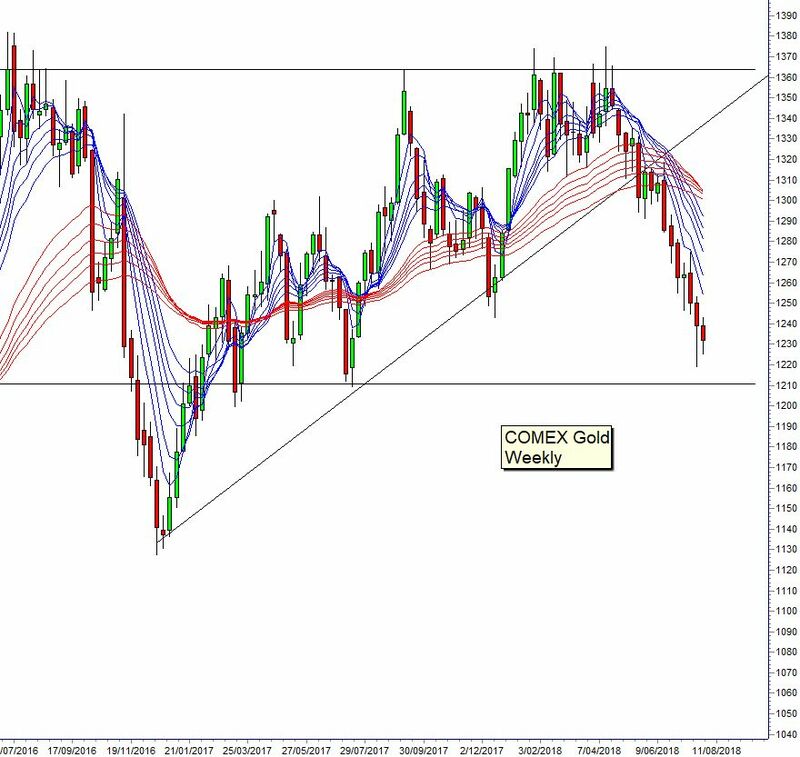 The gold price is characterized by trend rebounds from pivot point lows. Those are steep and rapid rebounds that have the characteristics of a short-term rally but also have a habit of developing into longer-term sustainable trends. The rally starting December, 2016 is the best example of that behavior. Gold fell 15 percent quickly to $1,135 in seven weeks. The 13 percent rebound rally moved just as quickly to $1,292 in 16 weeks. The pivot point trend reversal rally in January 2016 moved 18 percent to $1,263 is just six weeks. Traders need to move quickly when these trend reversals develop but there is one problem. These downtrend pivot point reversals often start in mid-air. That is, they do not start from historical support levels and this makes it difficult for traders to anticipate where they might occur. In November 2016 the gold price plummeted past the $1,210 support level on its way to the $1,135 low. Evidence of a potential pivot point rally rebound includes two features. The first is a slowing of downward momentum. The range from low to high for the week is significantly smaller than the previous weekly ranges. The second feature is a fast rebound with a significantly larger weekly low-to-high range. That is a large green candle that follows a much smaller red candle. Traders watch for those potential developments as the gold price approaches the historical support level near $1,210. If the pivot rebound rally does not develop from there, then the task of identifying the trend change becomes much more difficult. It means the next pivot point rebound could develop in mid-air and that requires faster trade management of short positions. Traders continue to trade the retreat behavior. We use the ANTSSYS trading method for this. Daryl Guppy is an independent technical analyst who appears frequently on CNBC Asia. He runs training, analysis and resource workshops for retail and professional financial market traders involved in stocks, CFDs, warrants, derivatives, futures and commodities in China, Malaysia, Singapore and Australia. He has his own trading company, guppytraders.com. Daryl Guppy is an independent technical analyst who appears frequently on CNBC Asia. Chinese President Xi Jinping's signature investment program isn't open enough for most companies to invest, according to a top European politician. The Bank of Korea said on Thursday that the South Korean economy likely contracted by 0.3% on a quarterly basis for the January to March period this year.